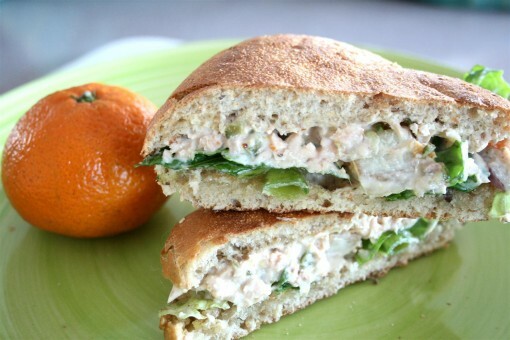 Creamy Salmon Sandwich was posted on January 30th, 2011 and is filed under Main Dishes, Protein, Recipes. This entry has 8 comments. You can follow any responses through the RSS 2.0 Comment Feed. I love bread, like a lot. When I was brainstorming a name for the blog, I laughed about calling it the “Carburetor”, simply because I adore my carbohydrates. I don’t usually crave meats or proteins too often; it’s always the carbs that call my name. We grow our own organic wheat and make our own bread, so my conscience is appeased, even though I’m fairly certain I eat too much of the wheat food group. Oh, right. There is no food group for wheat. Maybe I’ll make my own food pyramid. I’m all about quick recipes, especially at lunch when I’m usually beginning to wilt. There’s nothing easier than this. The salmon gives you your Omega 3’s, protein and calcium. The soft bones in canned salmon are perfectly edible and supply a hefty amount of calcium. This is one of my favourite lunches. Serves 2-4. Now stir it all up. Plop on a generous amount on your sandwich bread. Then add some sprouts and lettuce leaves, and voila! You may now eat it. Pack in your lunch and enjoy! What a nice alternative to tuna! I like that you include the nutritional information also. This looks delicious, and so simple! Love that you put the nutrition info at the end there! Only 130 calories and 9.5g of protein?! Great stuff and looks fabulous. Love the choice of bread. Looks delicious! 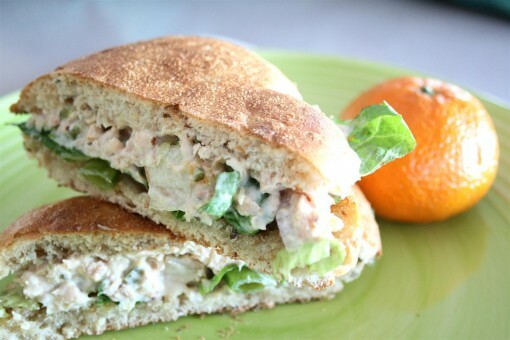 I love using canned salmon as a cheap, easy way to get more fish in my diet. I thing this is one of the simplest recipe to make with high protein. This is very easy and vitamin rich recipe.